Description: Handcrafted from Solid Brass, this Craftsman Signature Vanity Light is inspired by the Arts and Crafts movement. 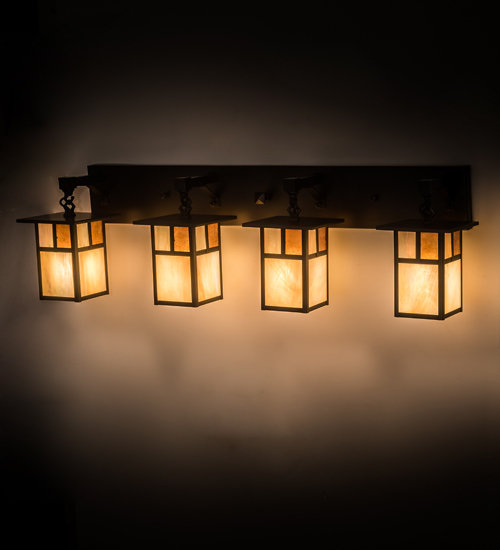 The striking Mission straight line design is featured in 4 Beige Iridescent art glass shades with Amber Mica accents which are suspended from arms, backplate and hardware hand finished in a warm Craftsman Brown hue. This fixture is ideal for a vanity light to illuminate fine baths or as a wall sconce in corridors and other rooms. Handcrafted by highly skilled artisans in our 180,000 square foot manufacturing facility in Upstate NY. Custom sizes, styles, colors and dimmable energy efficient lamping options are available. The 39-inch wide wall fixture is UL and cUL listed for dry and damp locations.